A three-course meal with a difference helped launch Abbotswood, the South East region's exciting new development in Hampshire. 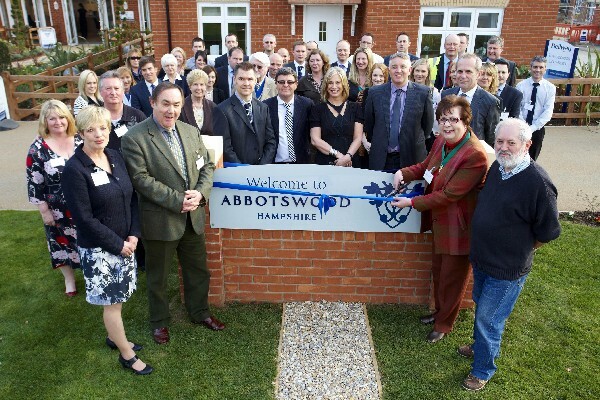 Abbotswood is a consortium site in Romsey, shared with Taylor Wimpey and Bellway Homes, and all three sales offices were put to use as more than 40 guests gathered to celebrate the official opening. Local community representatives met with the sales and build teams as starter canapés were served in the Bovis Homes sales office, followed by 'main course' bites at Bellway and puddings at Taylor Wimpey. In between courses the ribbon was cut to mark the opening of the development by Romsey Extra Parish Council Chairman Teresa Hibberd. Teresa, along with councillors and people from the local business community, were also given exclusive tours of the first show homes by each developer and there was an enthusiastic response to Bovis Homes' four-bed Canterbury and five-bed Lymington. Teresa said: "It's a great honour for me to open this new development, which is going to be a new community in Romsey. This is a very friendly town, and we will welcome all the residents from Abbotswood into our community, and look forward to meeting them. I wish the developers success in selling their homes and we look forward to the next stage of Abbotswood." Work on Abbotswood began in June 2011 and the development will see the creation of up to 800 new homes in total. The first phase of properties were released for sale in August 2011 with more than 60 already sold. Over a third of Abbotswood will be dedicated to open space and recreation areas, with features including newt habitat ponds, vegetation areas for local wildlife and open grass land. Further recreational space will be provided in a new play area, football pitches and dedicated walking/cycling routes. Abbotswood will also eventually provide a pub/restaurant, food store and nursery, together with a doctor/dentist and community centre. The new Government-backed 95% mortgage NewBuy is available at Abbotswood and could be the key to unlocking the homebuying dreams of Hampshire housebuyers at this attractive and superbly located development.